The meet features six disciplines, with athletes entering one of the six and swimming three different events within it. The disciplines are backstroke (50, 100, 200), breaststroke (50, 100, 200), butterfly (50, 100, 200), sprint free (50, 100, 200), distance free (200, 500, 1000) and IM (100, 200, 400), and the winner in each category is determined by a cumulative total – all three times are added up for a final time in the category. 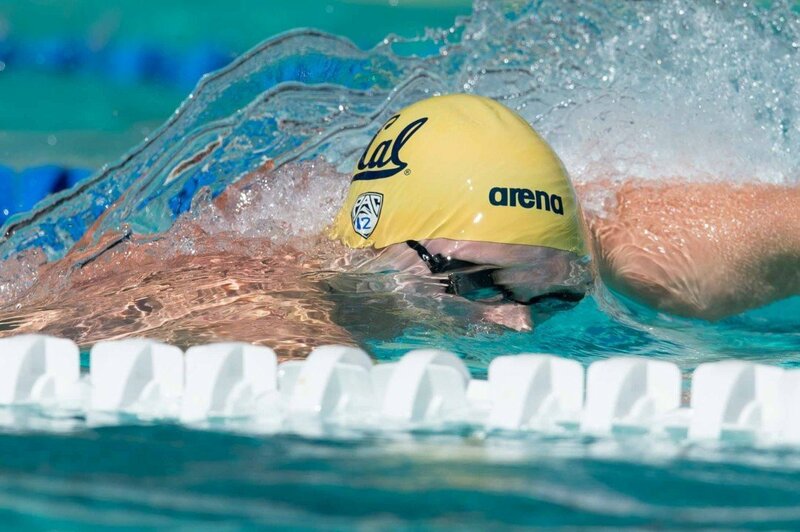 Cal managed to win the backstroke without even entering NCAA backstroke whiz Ryan Murphy. That’s because Murphy took on the sprint frees instead, winning that category as teammate Jacob Pebley handled the backstrokes. Murphy was 20.22 to win the 50, touching out Stanford’s Sam Perry by two tenths. In the 100, Perry beat Murphy by just .02. But in the all-important 200, Murphy wound up second (1:38.21) and Perry third (1:39.71), leaving Murphy the discipline winner. Cal senior Trent Williams won the 200 at 1:37.65, but an 8th-place finish in the 50 left him outside the win as well. Pebley nearly swept the backstrokes in Murphy’s absence. Pebley went 48.24 to win the 100 and 1:43.80 to take the 200, dropping only the 50. In that sprint race, Stanford freshman Ryan Dudzinski was 22.53 to Pebley’s 22.90. Dudzinski was also second in the 100 at 48.53, but fell to 6th in the 200. Stanford’s lone win came in the distance category, where senior Danny Thomson rolled over the field. Thomson won both of the longer races (500 free in 4:28.41 and 1000 free in 9:07.21) with great times and solid margins, and took second in the 200 at 1:41.33. His teammate Liam Egan was just a tick ahead at 1:41.25, a margin that turned out to be easily overcome in a category that finished with final times in the 15-minute range. The lone sweep of the meet came in the breaststroke, where Cal sophomore Connor Hoppe won all three contests. Hoppe was most dominant in the shorter distances (his 25.00 won the 50 by over a second, as did his 54.94 in the 100), but ground out a win in the 200 at 2:03.05. Cal freshman Carson Sand was second in all three races. The IM discipline really showed the importance of the longest race in each category. Stanford senior Gray Umbach won both the 100 IM (50.21) and 200 IM (1:48.46) by wide margins. But in the 400 IM, Cal freshman Ken Takahashi went 3:51.96 to win and steal the title from Umbach, who was third in 3:57.94. Cardinal sophomore Curtis Ogren was second in all three events, and Takahashi was third in the 100 (52.22) and 200 (1:50.52). Cal also won the butterfly, with Justin Lynch taking two of three. Lynch won the 50 (21.63) and (48.03), but looked like he might succumb to the same fate as Umbach in the 200. But while Stanford’s Jimmy Yoder won in 1:45.92, neither he nor second-place Long Gutierrez had the early swims banked up enough to beat Lynch, who went 1:47.00 and hung on for the discipline win. The meet concluded with a pair of relays, which the teams split. Cal won the 200 medley, going 1:28.56. That paired up category winners Murphy, Hoppe and Lynch with junior Jonathan Fiepke. Murphy, swimming his only backstroke race of the night, was 21.95, and Hoppe beat Stanford by nearly a second with his 24.42. Stanford answered back with a win in the 200 free relay, going 1:21.15. That included a 20.03 anchor leg from senior Jeff Garnier, plus a 20.37 leadoff from Perry. That 2000 from Clark Smith is pretty close to McBroom’s time last year, no? I imagine he’ll be doing that instead of the 2fly this year. Looks like may see Murphy swimming the 50 free this year on the first day. They added Seliskar and Thomas but lost Stubblefield, and the training will detract less from his backstroke focus. Plus if he wants to throw in a 100 free at trials it wouldn’t hurt. Probably also probing/enhancing his chances of making the 400 free relay for Rio. He had a heckuva 100 free on the relay at NCAAs last year. It’s tough to do both the free relay final and the 100 back final at the Olympics, which is a big reason why Grevers has been left off the relay the last two times. It’s about a 10 minute turn around. I hope all the former bolles guys do the 100 free this year (instead of the 2IM for murphy and schooling) along with conger (for him it would be dropping the 100 back)..
I’m inlove with Ryan Murphy and I am a dude. Its not a joke. Its a secret.